We asked Europa's owner, Carol Palmieri, to create a French-themed tea for our party of four, and to make a few concessions to eating healthfully. That last part is a pretty tall order for any traditional tea service, but Carol definitely had more fruits and veggies in this tea-meal than any others I've seen. We all really liked her choices, as well as the execution of each course, and we had a grand time. I wouldn't call it "high tea," if only because the dining room's style leans much more toward cute, lively and sunny rather than elegant, quiet and dignified--my mental image, at least, of high tea service. The group consisted of me, my mom and two friends of her generation. I've dragged my mother to a few teas in the past, but it was a new experience at least one of the others. After we selected our first pot of tea--a blend called French Breakfast, with a touch of fresh lavender added to the pot--Carol started our meal with a refreshing green salad that included arugula, shaved fresh fennel bulb (always a nice ingredient to encounter in a salad), chopped Kalamata olives, goat cheese and orange slices. On the side was a small slice of pumpkin loaf. A hit! We chatted for another quarter-hour or so and finished our tea. Then Carol brought out the centerpiece--a three-tiered display of mostly savory goodies. The largest plate, on the bottom, held a crepe stuffed with ratatouille and a small ham-and-cheese on croissant (approximating a croque monsieur) for each of us. The crepe was my favorite dish of the whole afternoon, and it drew raves all around the table. The second plate, mid-level, presented crostini topped with melted Brie and a little fig confit along with orange-peel mini-scones and pots of Devonshire cream and raspberry jam for the scones, as well as strawberries and grapes. 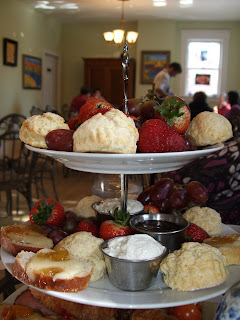 On the top tier was more fruit and scones. We stopped before eating everything in part because Carol told us we still had dessert to come. Our second pot of tea was a delightful, perfumed, low caffeine white tea. We also talked with our server, Irina, originally from Moscow, Russia. 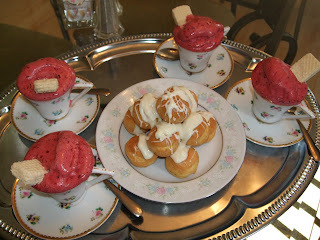 Thankfully, dessert was relatively light: house-made berry sorbetto with a pile of little white chocolate cream puffs. We did not want to imagine how many calories we consumed! 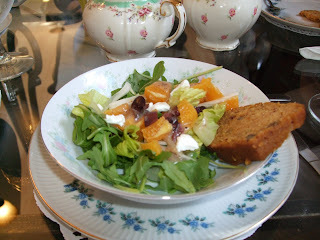 But we all vowed to make it our meal of the day and have a very light supper. All in all, we certainly enjoyed ourselves, and thank Carol for her creative efforts on our behalf. That's what I recall as a description of Trader Joe's mission, from a New York Times article a couple of years back. I almost blush to admit how many of their products show up in my cooking, but if you can have convenience and healthy, tasty food, what's not to like? The above photo of a mid-week supper includes butternut squash pureed with spices (cinnamon, cumin, ginger, a dash each of nutmeg and cayenne)-- the squash already peeled and cut into cubes at TJs. The veggies consist of leftover steamed Brussels sprouts mixed with a frozen TJ vegetable mix called "soycotash." 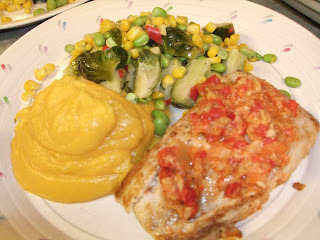 And the fish--grouper from Luken's at Findlay Market--is topped with Joe's artichoke and red pepper bruschetta sauce. If you want to convert to a more healthy diet but don't want to take up cooking as a vocation, you could do worse than to spend a half hour or so looking closely at TJ's produce, pantry, and frozen food aisles. And no, I am not on their payroll! Anyone who has a favorite grocery store, or particular products, that healthy foodies should know about, please weigh in. Leave a comment, or email me at pamamitchell@cinci.rr.com. 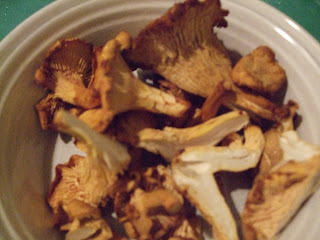 Chanterelle mushrooms are another special treat of an ingredient that are only available now and then. I got mine at Madison's @ Findlay Market. You might also find some at Whole Foods or Jungle Jim's. Unlike most other mushrooms, the stems are just as tasty as the caps, so you don't have a bit of waste. I'm including a shot of the raw 'shrooms, top, in case you aren't familiar with them. Before they became available here in Cincinnati, I used to smuggle them back from France in my suitcase. This recipe is for two, but as usual with my recipes, you can make twice the amount. 1. Heat oil in a large skillet over medium-high heat. Add chicken and saute for 3 minutes on one side. Turn over and saute for another 90 seconds. Chicken will not be completely cooked at this point. Remove to a plate and cover loosely with tin foil. 2. Reduce heat to medium. Add leeks and garlic, saute while stirring for 2-3 minutes, until leeks soften and begin to turn brown. If pan seems too dry, add a little chicken broth. 3. 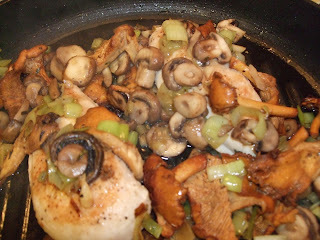 Add mushrooms and continue to cook, stirring, until mushrooms begin to brown, about 4 minutes. Add one cup of the chicken broth or stock and tarragon and stir well. 4. Return chicken to the pan, spoon some of the sauce over top of each chicken breast. Add salt and pepper. Cover and reduce heat to low. Add more broth/stock if the pan seems too dry. Cook for another 4-5 minutes until chicken is completely done. (Length of cooking time will depend on thickness of the chicken breast.) Serve immediately. My article about Europa Cafe (no website) ran in the Enquirer last week ("Under $25"). This photo isn't exactly of their healthiest stuff but it can't hurt to look. This Friday I'm taking my mom and two of her friends to try afternoon tea there. I asked Carol, the creative force behind the tea service, to make it a healthy-foodies' delight--include some fruits and veggies and don't go over the top with sugar, cream and butter, but still make it a treat for four tea-loving ladies. She's going to give it a try. I'll let you know what she comes up with! OMG, what a magnificant selection of drinks you'll find at Tonic, where every mixing ingredient in your cocktail is made in-house from fresh ingredients. The menu headings read "Classical," "Classic Punches," "Neo-Classical Originals" and "New Punches." Note that all the punches are made for multiple drinkers, two at a minimum. My husband and I tried two classical or neo-classical creations each. 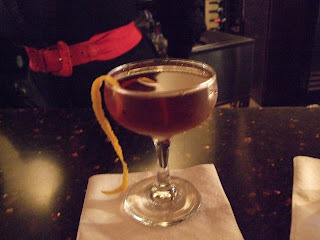 His favorite was the special of the night, Seelbach (bourbon, house-made bitters and I did not record the other ingredients). I loved the Liberal Liberal (bourbon, sweet vermouth, amaro and house-made orange bitters--in photo) and was pretty darn fond of my second drink, the Jequitaba Sour (rum, lemon, sugar, eggwhite and house floral bitters). There's a tiny menu of snacks and small plates, but after that much booze--no ice in any of the drinks to dilute the effects--we had to slip next door to Local 127 for something a little more substantial. It will take several visits to work our way through the dozen and a half cocktails, and we'll have to bring some friends with us so we can try the punches. On one of my long work days, I don't have time for cooking "from scratch," but we also don't bring cooked food home very often. What's a healthy foodie to do? Here is one reason why Trader Joe's is my favorite grocery store: their specialty in what a NY Times article once reported as "convenience foods for gourmets." 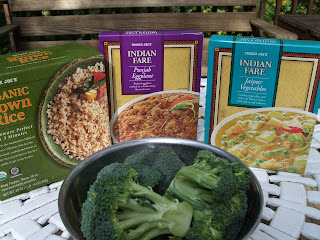 The first photo shows the products that made our dinner: two grocery shelf Indian dishes (both vegetarian) and frozen brown rice. I added some fresh broccoli. Steam the broccoli while you microwave the three other dishes, and voila! Photo #2. 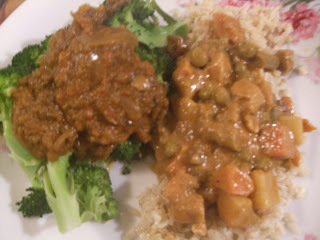 I topped the brocccoli with one of the Indian dishes (a spicy eggplant and tomato mixture) and put the second dish (less spicy-vegetables in a creamy sauce) atop the rice. Seriously, it was 15 minutes from photo #1 to photo #2. For a heartier appetite, add some nan bread--also sold at my favorite food store. Enjoy! 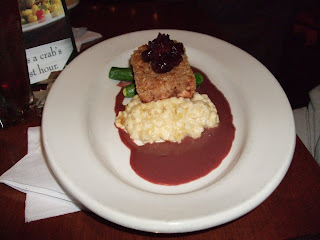 Saturday 10/17 the foodie highlights were a dinner special (walnut-encrusted salmon, top, served with butternut squash risotto and baby zucchini) that my aunt & uncle split. The photo is of a half portion, which was plenty, especially considering the richness of the dish. My swordfish was, sadly, overcooked and made a dull photo anyway so I'm not including it. 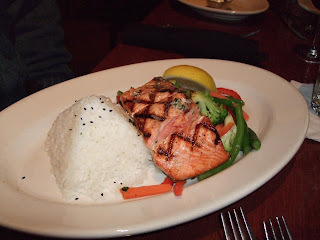 But my husband's steelhead with rice and veggies, bottom, was a big hit. 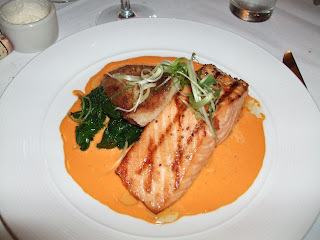 We had not heard of steelhead--it looks exactly like salmon but tastes milder, more like trout. Jean Huwer & I ate lunch at Salt of the Earth a couple of weeks ago, and my story about it appears in the Weekend section of the Enquirer (10/16/09). It's a nice place to stop, and I think it's an especially good gourmet-to-go option if you're looking for something for dinner. 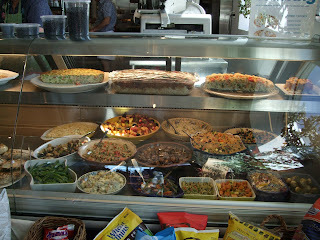 This photo shows the case with all their savory offerings (sorry about the glass glare), from quiches to poached salmon. More figs, you ask? I just happened still to have some fresh figs in my fridge, so I added them to this recipe. 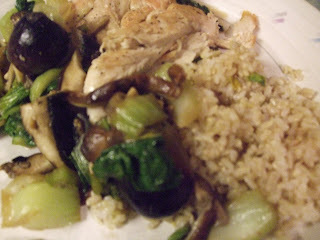 The dish will also be quick, healthy and satisfying if you make it sans figs. But they do add texture, natural sweetness, vitamins and of course fiber--all good healthy foodie things. 2. Heat oil in a large skillet over medium-high heat and add chicken when pan is hot. Cook without lifting the chicken for 3 minutes or until chicken starts to brown. Turn and do the same on the other side. When that side is browned, remove to a plate and tent with foil. 3. Reduce heat to medium. Add garlic and stir until it begins to brown, about 1 minute. 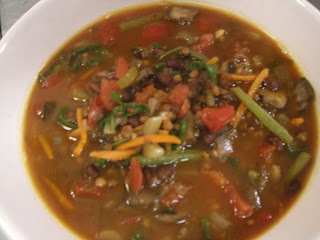 Add remaining ingredients, stir well, cover and cook until vegetables have wilted, about 3-4 minutes. 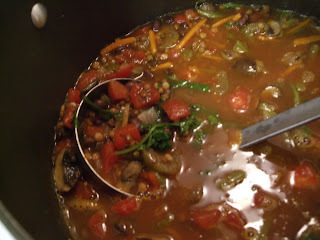 Add more stock if the dish seems too dry. 4. Return chicken and its juices to skillet, reduce heat to low, cover and cook until the chicken has heated through, about 3 minutes. Serve with brown or white rice—brown is healthier, of course. 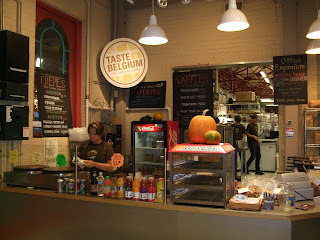 Inside the main building at Findlay Market, Taste of Belgium serves up fresh, made-to-order and authentically Gallic crepes and waffles. 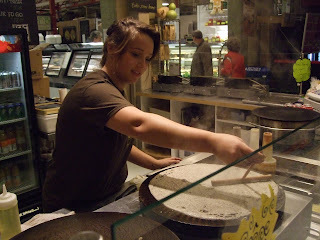 I go for the goat cheese, roasted red pepper and spinach crepe in a whole grain crepe. Have a hot cup of green, black or herbal tea with it at a nearby table, read the morning paper, and plan your shopping at the market's many stores and farm stands. Findlay Market is the best place to order a free-range, organic bird for Thanksgiving (try Busch's Country Corner, down the hall from Taste of Belgium, find exotic produce available nowhere else in the city at Madison's, and choose from what seems like all the fish in the sea at Luken's--just to name a few. Bean Haus coffee is right across from your waffle and creperie, should you prefer a cup of Joe. The market is open Tuesday - Sunday. The restaurant in question is in the space that used to be Jean-Robert at Pigall's, Local 127. It's at 127 W. 4th Street downtown and looks much the same as when it was the city's most upscale, fine-dining destination, but the food & wine concept and execution are quite different. I was hearing a lot of great buzz about the new place after it has been up and running for only a couple of weeks, so we had to hurry on down and give it a try. My husband and I went with two other wine-and-food-loving couples, and we had one heckuva feast. After all is said and done, I can confidently say we all give it an enthusiastically positive review. NOTE: Their web address appears to be just a placeholder--no content there when I looked. Highlights? 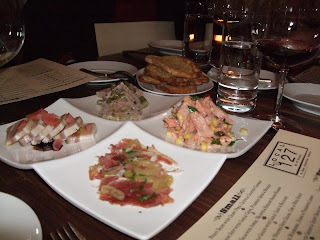 First was the pre-appetizer, a sampling of one thing that makes the restaurant unique: a selection of cured and pickled dishes for the table to share (pictured). Most were meat-based, and my favorites were a smoked trout concoction and the leanest pork-belly preparation I've ever tried. (Um, yes, pork belly is not normally on the healthy foodie's fork, but we do make exceptions--or at least, I do.) One of the best things I tried was the squash soup; the touch that made it memorable was a garnish of crispy slivers of garlic. I also loved my halibut entree. Those were healthy choices, at least. The wine list is extensive without being overwhelming, and it was fun to go with enough people that we got to try several bottles. Opening THIS WEEK next door is a fab-sounding cocktail lounge, TONIC. They're bringing in a couple of renowned mixologists to create some delicious cocktails. See you there! This recipe depends on coming up with a deeply flavorful mushroom sauce. My version might not have hit it as solidly as did the dish I had at Watts Grocery in Durham, but nonetheless my husband gave it an "A." We had enough leftover that you could have served three from this recipe, or you can double it and have plenty for four big appetites--and it's good leftover, too. 1. Remove the porcini mushrooms from the soaking liquid, reserving the liquid. Pat the mushrooms dry, chop coarsely and set aside. 2. Heat oil in a large skillet over medium heat. Add shallots and garlic; stir and cook until vegetables soften, about 3 minutes. 3. Add mushrooms and cook, stirring frequently, for 3 minutes until mushrooms begin to cook. Add 1/2 cup of stock, cover pan and cook another 5 minutes. Add seasonings and another 1/2 cup of stock. Reduce heat to low, cover and simmer for 15 minutes. 4. Meanwhile, bring a pot of salted water to a boil, add pasta and cook according to package directions. Drain when al dente and set aside. 5. Increase heat in skillet to medium and add chard, one cup at a time, until it has wilted. Add porcini liquid, taste and adjust seasonings (salt and pepper). If mixture seems too dry, add more stock or water. 6. Add pasta to the skillet and stir well until heated through. Remove to a serving platter or individual plates and dot with teaspoons of the goat cheese. Serve immediately. 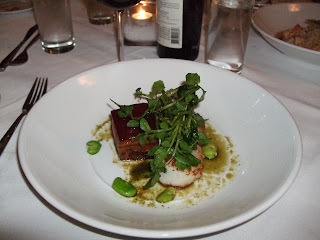 We had a fruity, not too tannic cabernet sauvignon blend from Chile with this dish and it was perfect. The wine was Palo Alto Reserve 2008, a blend of cabernet, carmenere and syrah. I took my mom to lunch at Biagio's Bistro (308 Ludlow Ave.) today. 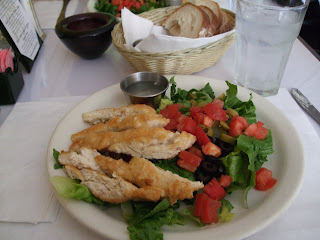 We both had my standard order: the house salad (hold the onions, dressing on the side) topped with sauteed chicken. While I think that much of chef/owner Biagio Lamassa's cooking is pedestrian, he nails the chicken every time. It's a boneless skinless breast, flattened to cook evenly, and sauteed perfectly with a golden brown crust and juicy, pale inner meat. Warm slices of chicken sit atop a bed of fresh romaine lettuce, sliced olives and diced tomatoes, which even in the off-seasons manage to be good quality. The restaurant was two-thirds full at lunch today--not bad for midweek in a recession--with many patrons conducting business over their meal. Other than the salad/chicken combo, Biagio makes reliably good soups and the occasional special dinner entree that's worth a try. 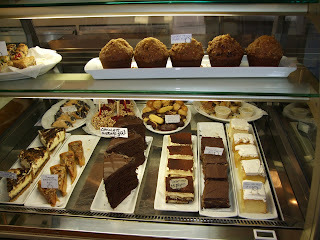 And the dessert case tempts with high-quality sweet treats. My favorite is a slice of first rate apple pie. I skipped it today (hooray for will power!) since I am atoning for the indulgent weekend in Carolina. Scary stuff about "the fishing-industrial complex"
"[But] the difficulty lies in forcing the fishing-industrial complex to catch fewer fish so that populations can rebuild. 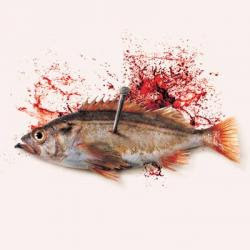 The truth is that governments are the only entities that can prevent the end of fish." My brother and his wife took me to two excellent, mid-range restaurants in revitalized downtown Durham (home of Duke University). Friday night I had a scrumptious pasta dish--pappardelle with mushroom ragu, chard and goat cheese at a place called Watts Grocery. We were so hungry by the time we were able to get there, I did not even photograph that delicious entree. However, I am planning to try to reproduce those flavors soon. Next evening, we tried the more upscale Revolution. Here are two amazing seafood dishes--diver scallops with a rather sinful slab of seared pork belly (OK, not healthy), and my brother's salmon filet. We also enjoyed some creative cocktails and doggone good wine, too. To top it off, dinner at their house Sunday night was charcoal grilled steaks and a bottle of 1989 Chateau Margaux. I think I'll be atoning the rest of the week! I'm back in the "old north state"--that's North Carolina to most of y'all. Today we're heading to one of my favorite foodie places in the US of A -- Chapel Hill. Stories and photos to come! This goes well with a crisp, acidic white wine, such as Sauvignon Blanc. Add a small salad and some crusty bread (if you can handle that many carbs), and you are good to go.